Understand the Analemma and unlock the secrets of winter cycling. 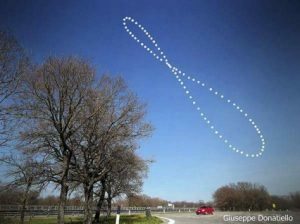 12 Dec Forget the Solstice – Today’s the Analemma! As a year-around cyclist, winter is always tough: short days, low temps. In winter, I spend a lot more time putting on and taking off gear than in the relatively carefree summer days of shorts and a short-sleeve jersey. As the autumn progresses I always keep a sharp eye on the calendar, almost willing it closer to the solstice: the shortest day of the year – when the sun rises the latest in the morning and sets the earliest in the afternoon. I know from that day on – for 6 entire months – every day is a little bit longer than the one before. Or so I had been told… and believed for many years. One year, however, I looked more carefully at exactly when the sun was rising and setting. What I saw shook up my view of the world, literally. As the solstice approached, the rate of change from day to day becomes progressively slower. When the sun is over the equator, at the equinox, the length of each day is noticeably longer. But as the solstice approaches, the change each day is far more subtle. Near the solstice, the sun seemingly lingers for several days at a time, recording the same sunrise or sunset as measured by minutes. But that is when I saw something weird. The earliest sunset was weeks before the solstice. It was in early December, rather than on the day of the solstice, usually Dec 20, 21, or 22. And just as disconcertingly, the sunrise was still getting later long after the solstice, right into January. After double-checking the numbers, the dates, everything, I tried to reconcile myself to these observations. Logically, it seemed possible that the shortest day of the year could still be on a day between the latest sunrise and earliest sunset. Nevertheless, it was unsettling: no one ever told me this! What’s the Analemma Got To Do With It? It took me a while (probably a couple years) to figure it out. I asked an amateur astronomer whether he could explain it, but he drew a blank. Eventually, I came across something astronomers call the “analemma.” It explains what is going on based on the “tilt” of the earth in relation to its orbit around the sun, and the fact that the orbit itself is elliptical, rather than circular. I cannot form a picture of it in my mind, or even model it holding a ball pretending it is the earth (believe me, I tried!). I’m reconciled to this unexpected situation. I’ll take the astronomers’ word for what is going on. The good news is that today, December 12, 2017, not the solstice this year on December 21st, the sun will set earlier than any other day this year. From today we start the long march back to longer days and more sunshine. Tomorrow the sun will set just a wee bit later than today. And everyday after will have a later sunset until early June. It’s fine to celebrate the solstice. Why not also celebrate the analemma? There are six months until the next edition of the White Rose Classic and the afternoons are already starting to stretch!